3. There Are Fabric and Thread Scraps Everywhere! As far as addictions go, an addiction to sewing or embroidery isn’t that bad. However, this hobby can quickly become something you feel compelled to do, and it can completely sneak up on you. Before you know it, you went from hobbyist to full-on sewing and embroidery addict! 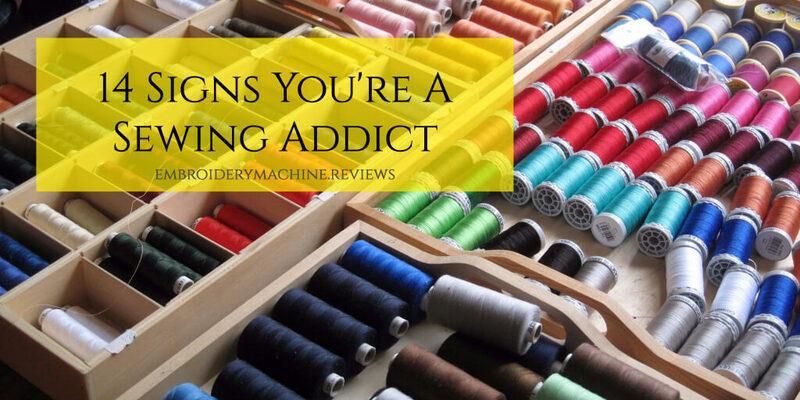 In case you don’t know what to look for, we’ll give you fourteen signs to look for so you can gauge where you are on your sewing or embroidery addiction. A classic sign of a sewing or embroidery addiction is having multiple projects on your mind and at least two going at once. You can’t wait to finish the projects you have going, so you can quickly start another one. Additionally, it isn’t unusual for you to have one or two projects in your bag to work on. Do you know how hard it is to find a good pair of scissors?! If you’re a sewing or embroidery addict, you know the struggle is real. You’ve most likely found your favorite pair, and Fort Knox has nothing on you with how you guard them. They’ll have to pry your favorite pair of scissors out of your hands to get them! If you have bags or boxes of fabric scraps and odd spools of thread lying around, you could be addicted. You may even have forgotten what your craft room or table looks like because they’re buried underneath all of your scraps. You’ve also learned over the years to avoid wearing black as it seems to attract every stray thread and scrap. You don’t even have to be present in the room anymore for people to aid your sewing or embroidery addiction. Any time a co-worker, family member, or a friend mentions textiles; your name comes up. You get bonus points if you can spot it happening from across the room. If you have kids, you get very excited every time they bring home a note saying they need a costume for a play or a party. This means you get to visit the fabric store and bring home, even more, fabric to create the costume out of. Face it; you’ll most likely end up making costumes for the whole class by the end. It’s easy for you to tell when you haven’t sewn or embroidered a project in several days because you get crabby. You HAVE to feed your sewing or embroidery addiction to keep yourself happy and balanced. It’s also good for anyone who lives with you as they’ll agree you’re happier when you’re working on a project. Your friends have become your enablers over the years, and it isn’t uncommon for them to bring you things because they just knew you can fix it. It doesn’t matter if it’s a button, tear, patch, or they want something pretty added, they all come to you. This is one of the biggest signs you have a sewing or an embroidery addiction. Your fingertips have next to no nerves anymore due to pinpricks, and you have needle marks under your nails. Every time a commercial comes on for your favorite fabric store, you’re hooked. You’re constantly hoping to hear the words ‘clearance’ and ‘half off.’ It doesn’t matter if you were just there two days ago, you have to go and see the clearance items NOW. Your projects start to take over your life, and you find yourself canceling on social engagements with your friends because you prefer to stay home. If you do go out, you think of how far you could have gotten on your projects, and you cut out early to get just one more row done. If you don’t have a sewing or embroidery tattoo already, chances are you have one planned out, and you’re just trying to find the time to get it done. You’re proud of your addiction, and you want to show it off. Two words: Pinterest board. You most likely have one or two entire boards dedicated to your sewing or embroidery addiction. It has everything from patterns you’ve made, patterns you’re currently making, or patterns you’ll have to squeeze in in the near future because there are just not enough hours in the day! You’ve spent a large amount of time meeting and collecting like-minded people who adore to embroider and sew as much as you do. You’ve found your people, and they encourage your addiction by sharing patterns, ideas, tips, and tricks they’ve gained over the years. For the safety of all of your friends and family, your craft room is one place in your home where shoes are mandatory. This helps to prevent pin sticks and minor injuries that occur when people walk around barefoot. Your family and friends have learned the hard way, and this rule is really for their safety. So what do you think? How high do you score on the embroidery and sewing addiction scale? If you don’t score that high yet, just give it time. This fun pastime is making a comeback, and you’ll eventually get swept up in the rush that comes with creating new projects. With this in mind, have fun and sew or embroider on!